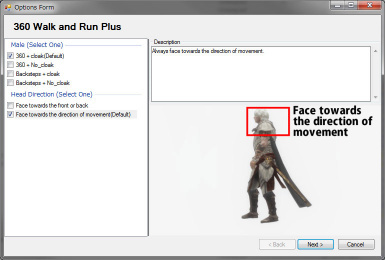 This tiny mod lets your character to walk toward near side of the screen. 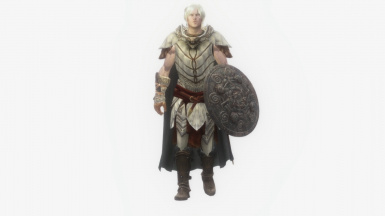 This tiny mod lets your character to walk toward near side of the screen instead of backsteps when weapon is sheathed. Q. Is "pseudo-waving cloak" function compatible with _______? -Please refer to the list below. Please let me know if you find. Q. I want to keep using backsteps but want to use "pseudo-waving cloak" function. -Your demand is supported. Please tick the third from the top option in installation wizard. I strongly recommend you to use MO/BAIN/NMM to install. Activate and follow the instructions of installation wizard. If you're using MO 1.2.10, you need to update it to 1.2.11 to install the files correctly. Open Installers tab, right click, select "Wizard", and follow the instructions of installation wizard. (Optional)Copy ESP file to Data folder. This mod has no script, no havok behavior, so never dirty your save file. You can uninstall it whenever you want. Open Installers tab, right click, select "Uninstall". Delete the HKX files you installed. (Optional)Delete 360WalkandRunPlus-RunBackwardSpeedAdjust.esp if you installed. 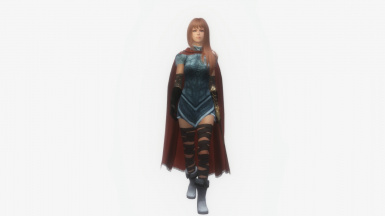 +Added BBP effect version, but 360 only. +Added an ESP file to adjust run backward movement speed. 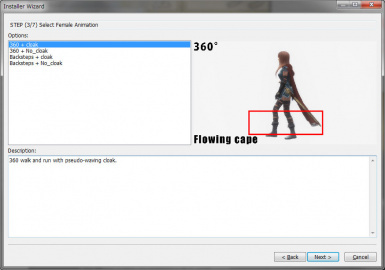 !Fixed corrupted Skirt L Bones of male walking animation.